High-fiber foods can help lower cholesterol, improve digestive health and control your blood sugar levels. Harvard University recommends aiming for 25 to 35 grams of total fiber per day, along with plenty of water to help fiber function in your system. High-fiber juices such as smoothies add fiber and fluids to your daily diet. You can also add fiber to other juices to improve your overall health. Fiber is a type of carbohydrate that is essential for good nutrition and health, although, unlike other carbs, your body cannot digest or absorb it. The two main types of fiber also play different nutritional roles. Insoluble fiber -- roughage -- helps you stay regular by bulking up and softening stools. Soluble fiber binds water to form a gel in your intestines, helping to remove unhealthy cholesterol from your body. Smoothies are high-fiber juices because they can contain the whole fruit or vegetable. The added water, juice, low-fat milk or yogurt in a smoothie gives you additional fluids. Make your smoothie with a whole apple with the skin on to get 2.8 grams of total fiber. Berries such raspberries pack a fiber punch with 3.3 grams of total fiber in a single cup. A small peeled orange adds 2.9 grams of total fiber to your smoothie, while a cup of cubed watermelon is high in water but only contains 0.6 gram of total fiber. High-fiber juices can help you get your daily recommended serving of fruit and vegetables. According to the Cleveland Clinic, a cup of raw vegetables, a cup of melons or berries or a medium-sized piece of fruit is equivalent to one serving. If you prefer store-bought fruit and vegetable juices, choose high-pulp varieties and add your own fruit puree to it to make it high-fiber. 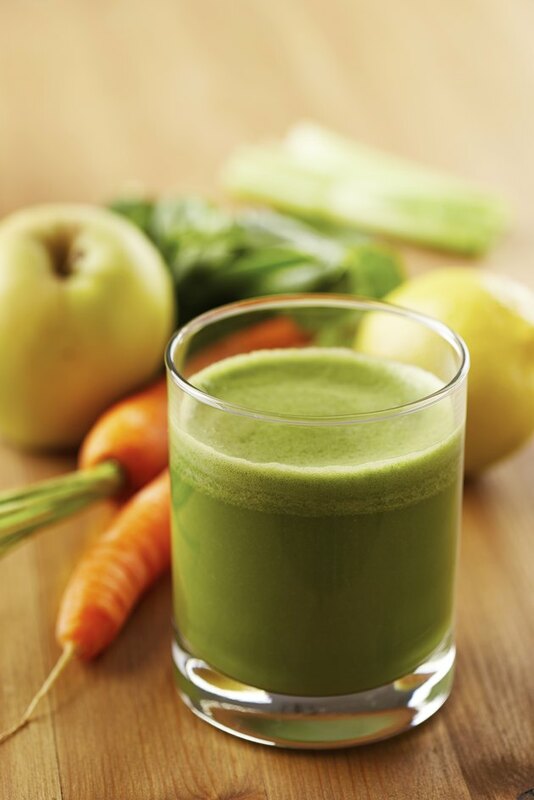 Simply blend raw vegetables such as carrots, cucumber or tomatoes or a cup of fruit and stir it into your juice. It is important to add whole fruits and vegetables when possible because they contain more fiber than juice with pulp alone. Juicing is one way to drink your fruits and vegetables. The website Oncology Nutrition advises that it can occasionally be a healthy way to add additional nutrients to an already balanced diet. But juicing removes all of the peel and most of the pulp from fruits and vegetables, making it low in fiber. Add fiber to your fresh juices by stirring in a spoonful of the extracted pulp and by adding ground seeds such as flaxseeds.